Reach out to the Cannon Delivery Service, Inc. customer service department with the specifications for your delivery and we will help you choose the vehicle and service level to get the job done right. Prices are based on the priority level of the requested service and the distance between the pickup and delivery sites. These services are available Monday through Friday within Metro Atlanta, Georgia. Out-of-town, after-hours, weekends, and holiday deliveries have different service levels. From across town to across the Southeast, Cannon Delivery Service, Inc. will get your shipment where it needs to be safely and undamaged. Unlike some next-day delivery services, your package is not moved from vehicle to vehicle before delivery. 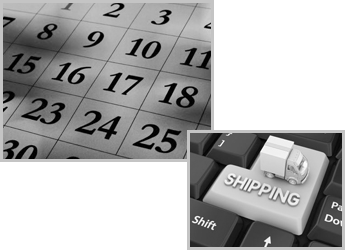 We can deliver the same day and in most cases, it is less expensive than next-day delivery. The service levels listed below are for deliveries requiring cars, trucks, cargo vans, or Sprinter™ vans – the larger trucks are listed separately. This is a service designed for orders that are done on a repeat basis. Just give us the times and dates and we can program the order, with your specific details, in our system. The only time you need to call is to change or cancel the order. You can also place orders for one-time deliveries in the future with this service. Rental drivers are perfect for clients with multiple daily deliveries. The drivers providing this service are the same professionals as the on-demand drivers with the same vehicle choices. This is a great solution for seasonal deliveries or running between job sites. The drivers are dedicated to your company while providing this service. We have 24' and 26' dock trucks as well as a 24' flatbed stake side truck. All of these vehicles are equipped with lift gates. We also have 14' and 16' trucks. Some of these have lift gates and can be a good alternative to the larger vehicles. Read more about our dock trucks and flatbed service.